Two of my girlfriends make the best mexican food. I'm talking about the real stuff you'll find away from the resorts in Mexico. They make tortillas from scratch, cook mole, you name it they can do it. Me, however, I love to cook tex-mex style. If it comes from Old El Paso, I'll have made it. I do make a number of variations on your standard box recipe that are very simple. Nick & I cooked this recipe Saturday night when it was way too hot to be heating food indoors. It is so easy to make this meal and your oven can stay off. It's win win. Cut a steak into strips. Mix some Old El Paso taco sauce and a few shakes of mexican chilli powder in a jug with 100mls or so of water. Cook the meat, mushrooms and onion on the BBQ hotplate, when about done add the sauce and mix it through. Add some chopped red onion, spring onion, 2 green chilli balls, coriander, juice of 2 limes, a spoon full of capers and a little bit of olive oil to your blender or food processor (I just got one of those stick blenders with the chopper attachment - it has changed my world) and process for a few seconds. Instant salsa. Finely chop some coriander and red onion. Mash the avacado. Then add the coriander and red onion to the avocado with a little lime juice and a lot of salt and papper. Chop some onion, chop some lettuce and grate some cheese. Warm these on the BBQ - you will not regret it. Lazy gals sangria - just mix 2/3 red wine with 1/3 lemonade & a few squeezes of lime juice. Add lots of ice and you got some sangria! 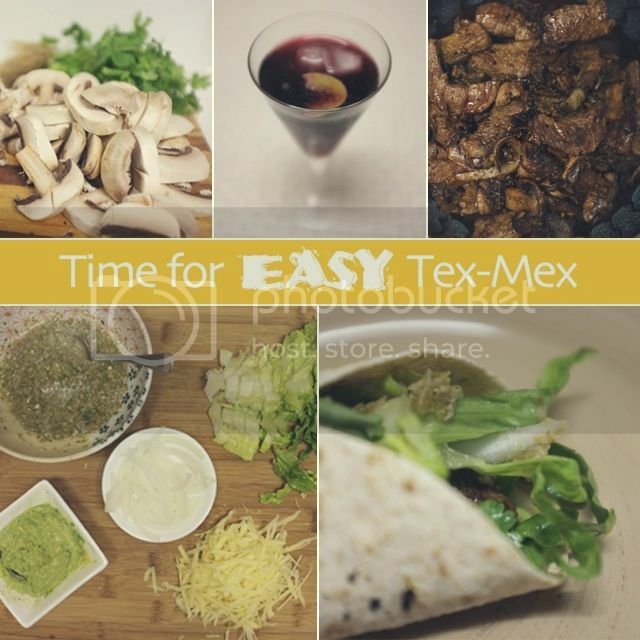 Easy tex-mex sorted - there ain't nothing wrong with a little Old El Paso in your life.